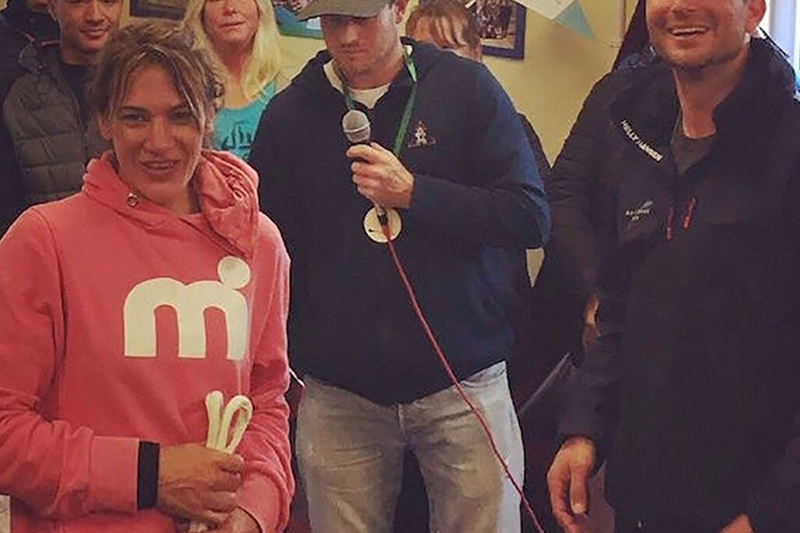 Here at Mistral, we’re busy doing more behind the scenes to create a revolution within the water sports industry than we have for many years before and in due course we will be sharing our developments and vision with you. 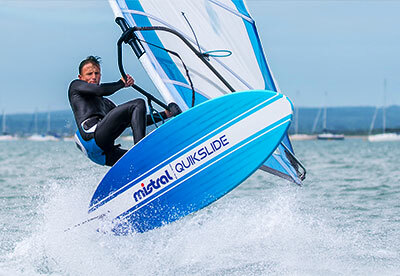 Mostly, we want to ensure water sports can once again be embraced as ever more vibrant, colourful, positive, fresh and cool to be a part of - all of which Mistral have been at the forefront of for over 40 years. We’re super excited to get the season under way, with new offerings for the year ahead and with so many developments in the pipeline. With spring now upon us here in Europe and optimism for the months ahead for warm weather, longer days and languid evenings, our thoughts turn to time on the water, time with friends and family and days spent embracing nature. That we create not just the means for you to embrace your passion, we also love to kit you out from head to toe with apparel that counts and with accessories that tick the boxes. The growth of SUP sport has been a roller coaster ride of development and along the way, Mistral has contributed to the technological advancement of the sport on many different levels to which we still continue to contribute and lead, with such incarnations as Dual Chamber Trekker Boards, for real world adventuring, offering added safety features and 4 Chamber Boards for advanced hull refinements, superior rigidity and speed with the Vortex Air / Slipstream Air receiving rave reviews for 2019. 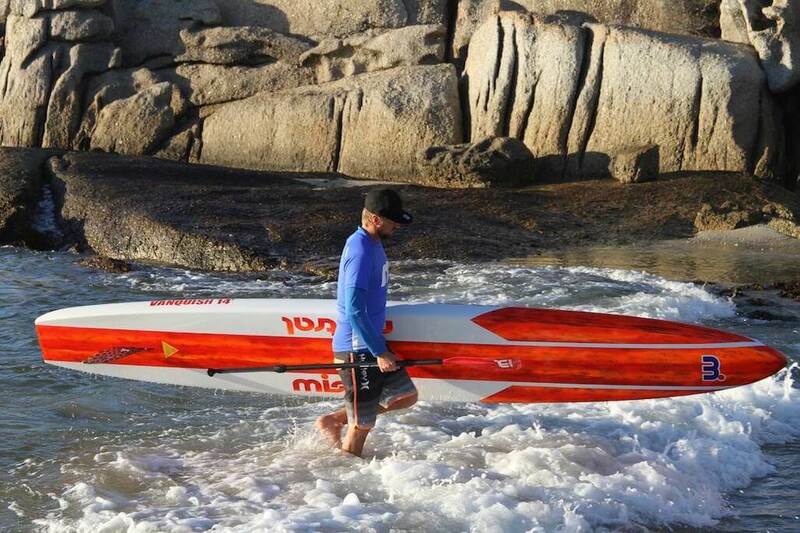 We developed the worlds lightest and toughest inflatable boards in the early days of the sports development, thereby changing the sport's practicality and its broader appeal for the traveller, while also pioneering the WindSUP® concept and continue to advocate the valued benefits of this adaptable craft. We designed specific rigs for both use on laminated and inflatable SUPs and our Mast Plate to board attachment for our inflatable WindSUP® Santa Anna Boards, remains to this day, the best solution to provide to the rider the greatest degree of flexibility for the use of other rigs and indeed in order to safe guard the integrity of the board. 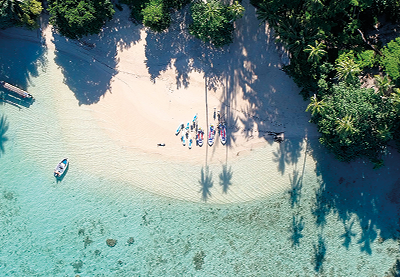 We’ve created record breaking race boards and introduced Tahitian paddlers to the world of SUP and continue to support activities within this region of the Pacific as part of our reaching out to a world which we love and embrace and enjoy sharing with you and drawing inspiration. 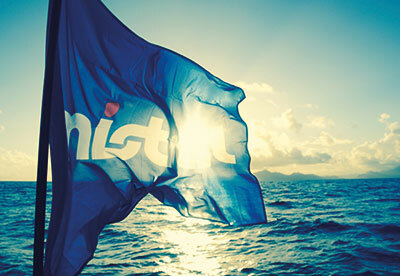 Wishing you a safe and Happy Easter on the water, at the beach or wherever you find yourself from all the Mistral Team! Head of the Dart Race England - (8 mile river race, Britain's largest SUP race) Congratulations to Ginnie Odetayo for her 2nd place finish in the female 14' division (Vortex) just behind the winner in a field of some 120 competitors and to James Van Drunen who also finished second racing his new 14'SD1 Vortex in a field of over 200 competitors, just a few seconds behind first place over the 8 mile course. James led for most of the race, but his tactics worked against him in the closing kilometre in a royal battle between he and former team mate Ryan James. The friendly rivalry will continue on the 28th when they and other competitors will meet for London's Battle of the Thames, where James will be present to defend his title. On a footnote, James was also awarded a Junior Award for the 1st youngest competitor. Great job! Meanwhile in South Africa - the Vanquish 14' arrives on its shores along with other new models unique to the SA market. South Africa is a uniquely placed bastion of the world in relation to its waters and winds. While it has its protected areas, it's a wild and crazy geographical part of the planet in relative isolation, fringed by wild oceans, winds, sea life, currents and winds and a breeding ground of some of the most accomplished waterman and women on the planet . . .
OK, so you want to buy an inflatable stand up paddle board and you’re now completely confused having begun your search and been overloaded with choice. You could go for the cheapest on the market and by this measure, you will be investing in it’s only USP (industry speak for Unique Selling Point) – the price. If you travel this pathway, know that you will get exactly what you pay for; poor materials, poor warranty (if any), lack of rigidity and therefore performance, poor valve systems, ineffectual undersized bags, inferior hand pump and little or no resale value. All in all, they serve a niche market for the relatively disinterested end-user not particular interested in investing in quality but more of a disposable consumable, where brand quality means little. Importantly, don’t be fooled also into thinking your SUP inflatable should look surf-board like in shape, unless you aim to sup-surf only, in which case the laminated board is the best option, always. On the other hand, we’ve since discovered our Tribe boards are also fun in shallow plunging waves as we found out in Tahiti in the right hands. Our entry level Tribe boards, Lombok, Sumatra and Java, so named to reflect the idea of a family tribe using them, were from the outset, designed to break the mould on typical elliptical shaped boards in the market. What we wanted to do was design a shape that made sense from a paddling and handling perspective.Rave reviews in the German Press, confirmed what we knew to be correct that this shape of board offered a fast, streamlined feel with improved handling upwind and in head chop, super high levels of stability with the wide tail providing excellent step back tail spinning fun. Additionally the boards hold a good line when paddled and the slide in fin makes setting up super easy. Add to this convenient bow grab handle and cargo net, carry handle, rear and bow D-rings for mooring, D-ring for ease of leash attachment, a mix of smooth skin and diamond shaped crocodile EVA and top line striking graphics, you have a board that’s been well thought out with the end-user in mind. To seal the deal on these epic entry boards, our super neat and sturdy roller travel bag, big enough to carry your clothes for a weekend getaway all in the one back, along with our dual action hand pump. 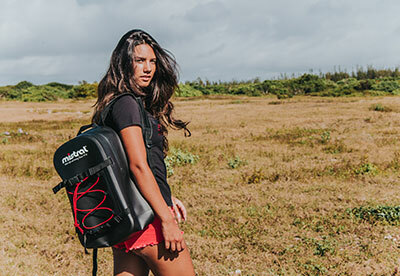 The bag, should not be overlooked in the buy-in process – it matters and we’ve put a lot of thought into them, up to and including the water-proof internal lining. Last year we added the Bali board to the Tribe range – ideal for young children, it features all the great attributes of the other boards and presents in striking fun colours. So if you’re in the market to enter the sport or indeed kit out your school or resort, consider your purchase as an investment, not just a disposal item and reap the rewards of a Mistral designed and created product. ​SUP surfing is a niche interest area of our sport and only just recently it seems, SUP surfers are ‘discovering’ our range of Squab and Cloud boards and even our Levuka. Take this recent review where our Squab 7’10 was matched against JP and Starboard boards of similar spec where our Squab came out on top as the pick of the bunch. Aimed at the entry to upper level intermediate rider, our SUP surf boards are classic shapes, with a custom feel that should tick the boxes for most everyone. Seriously cool graphics, quality hand layups and all machine and hand shaped they include Futures fin boxes. There’s everything to like about these boards which defy their production status. 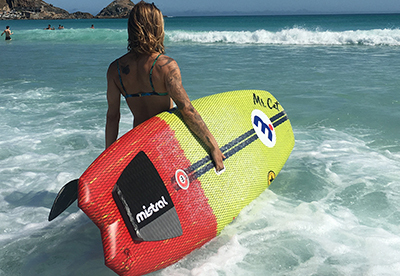 Created by Chris Diplock and Steve West, the boards are ‘classic’ designs which will remain in the Mistral line up for some years to come. Stand up paddle addict and shop Owner of Surf Shop Castricum, Robert, travelled with his team buddy Jeroen to Plage Goulien-Crozon in French Britanny to test the new Mistral Squab against a couple of comparable sized boards. We are both big fellas (93+94kg) so opted for 115-129l compact boards. At Plage Goulien, we scored a variety of conditions from shoulder-high light offshore waves, to 3m peeling with a decent side shore breeze. Goulien isn’t a barreling wave, but it’s got plenty of speed and we scored long rides. The new Squab doesn’t look and feel at all like a production board. The rather square and wide tailed Squab has a custom board feel and build, in light weight glass-vector and epoxy resin paint construction, reinforced with a carbon tape stringer on bottom and deck. No paint or filler, makes this stylish baby, pure eye candy and looking very custom like! On the deck the Squab has just a kick pad, so you can add a big pad on it yourself, or wax it for the ultimate surf feeling, or if you like, lightweight without the mess, add RSPro Hexatraction, which is what we opted for. If you flip the board, you see 5 nice Futures boxes and a high quality quad set. The board has an intermediate rocker with a light mono-concave running in a channel with some serious tail kick. We really didn’t know what to expect with the Squab. A wide and rather square board, but also lots of rocker, but the proof is in the pudding! The Squab paddles out very easy. The wide tail adds a lot of stability and the 7.9kg makes the board move easily through the water. Although there is no pad the board feels very composed, probably due the construction. On a wave the big surprise started. The Squab takes off very quick, quicker than most boards we tried and when moving down the line you have a nice controlled feel, especially with the back foot on the tail pad the Squab turns on a dime. Robert who is a true goofy footed back foot quad lover, was ripping like I have never seen him doing before. Nice bottom turns, showing some fins in-between and sliding top-turns with some serious spray in 2-3m waves. After seeing Robert ripping, I wanted to try it as well. Like Robert, great acceleration and back-footed, Wow! Not the fastest board we tried when chasing down the line, but the loosest and most playful board we tried in normal conditions, especially when the wave wasnt that spectacular, the Squab has ample of drive and shows it’s true strength. A perfect board that makes you feel like ‘Kelly’ in the not so perfect conditions. When pulling into some steeper, faster sections that needed to surf more over the front foot, it started to slip and slide a bit in the top turn. A tri-fin set-up might help there as well, by keeping everything under control; but for such waves, there are different boards. We are were both very impressed by the Squab, specially for the smaller, softer waves and back footed riders the Squab opens up a whole new ‘turny’ dimension. Experiment with fin set up. Author: Jeroen van Gessel, Teamrider Surf Sport Castricum. No matter how long you’ve spent on the water, on a wide and varied number of water craft, in as many water and weather conditions, when it comes to the design process, working in a small team with like minded individuals, helps to validate your intuitive ideas and take them forward with greater confidence. 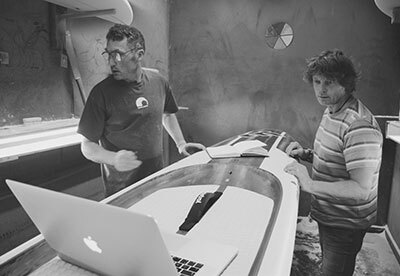 Our Mistral Design and Creative Team, Chris ‘Bro’ Diplock and Steve West, have between them, over 60 years of design knowledge, ranging from surfboard, windsurfing, prone paddleboards, outrigger canoes, paddle and sail design and more recently Mistral hardboards coinciding with the sports arrival onto the scene. Good design is a complicated process, which requires an initial brief or idea as to what the board will be intended for, so as it can perform successfully within those parameters. From conception, to making the 3D files, to computer cutting the foam blank, hand shaping the final details and laminating, it’s an anxious time as you work towards that first sample test board and the on water sessions which follow. Feedback from team riders, provides the primary bases for adjustment or not, with some testing often carried out by West in order to ‘feel’ if the overall end-goal in performance is being met and that riders can indeed get out of the board what they put in. While designs can indeed be fine tuned over time, the catalyst for this, can also sometimes be due to improved abilities of the riders, as a sport matures, but equally at Mistral, we strive to create, ‘Classic’ boards, as an acknowledgement end-users prefer constants, rather than continual change. ‘Bro’ hails from Cornwall, Britain’s bastion of surfing and is something of a UK legend in his field, whilst West, has lived a varied waterman’s life in Africa, Mauritius, Australia, the UK and all parts of the Pacific and its islands. Competitive successes, combined with work within paddle sports in particular, is documented through his books and used as reference sources at the Universities of Hawaii and the University of the South Pacific. 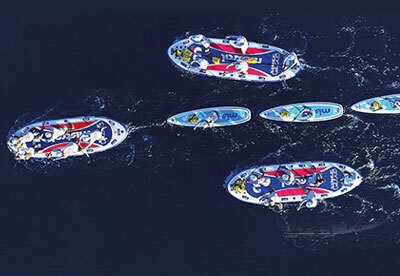 Together, they have created such record making boards such as the Slipstream, Vortex , Equinox 14‘ boards and more recently the new Vanquish 14‘, not to overlook the popular Levuka, Fiji and Levu boards and all of our other Mistral hardboards.